When we started to measure the popularity of search engines 3 years ago, Solr clearly dominated that category followed by Sphinx and Elasticsearch on the third rank. Since that time Elasticsearch impressively increased its popularity. It passed Sphinx in June 2013 and continuously reduced the gap to Solr, until it finally took the lead in our recent ranking. in the past 3 years, Solr has almost doubled its job offerings; but the number of open jobs for Elasticsearch was exploding by a factor of 20 (!) during the same period. This is a strong indication that Elasticsearch is no longer only a Solr alternative for techies, but is used throughout the industry. Today we still count about 30% more open jobs for Solr than for Elasticsearch, but extrapolating from the current trend, it seems to be a matter of months that we will measure a reverse order here. both are based on the Apache Lucene Core libraries. With the new major version 2.0 (released in autumn 2015), Elasticsearch brought several new features (a new type of aggregations, a simplified query language), improved performance and hardened security. Elastic, the commercial entity behind Elasticsearch rolled out two 'Elasticsearch-as-a-service' offerings. The first is aimed at developers and start-ups and allows a jump-start with Elasticsearch. The second one is a production grade offering, aimed at larger enterprises and includes additional support services. Elastic is heavily promoting its 'ELK stack', a fully-fledged analytics platform based on the open source tools Elasticsearch, Logstash (a data pipeline for processing and managing logs from various systems) and Kibana (a data visualization tool). The ELK stack faces competitors like Splunk or Datastax Enterprise (built on Cassandra, Solr and Apache Spark). 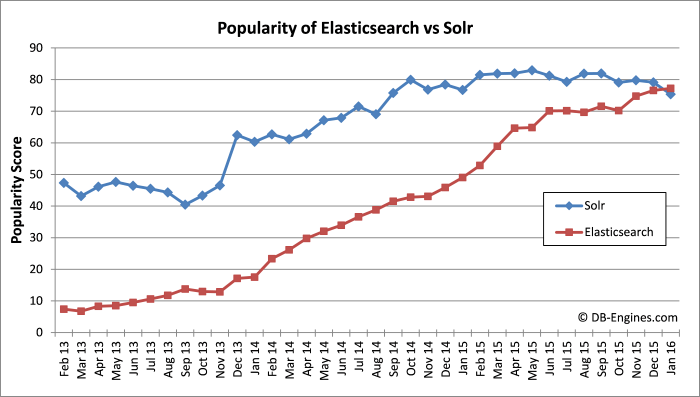 It will interesting to watch what the rivalry between Elasticsearch and Solr will bring in the future.